This exclusive set of 2 microwave plate covers is the perfect tool for keeping your microwave clean, and your food hot and ready until you are! 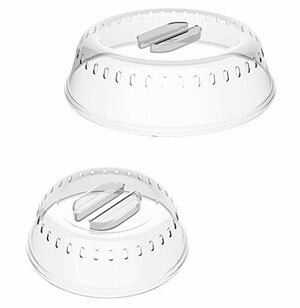 It prevents food splattering by guarding the plate, but still leaves ventilation holes for proper cooking and heating. The large plate cover is 10.25 inches long and fits most standard dinner plates. The small plate cover is 6.75 inches and fits smaller plates or bowls. These covers will also come in handy during picnic season to keep bugs and leaves out of dishes.